On the 9th of February, the King appointed Keoni Ana as Minister of the Interior [Kuhina Kalaiaina]. 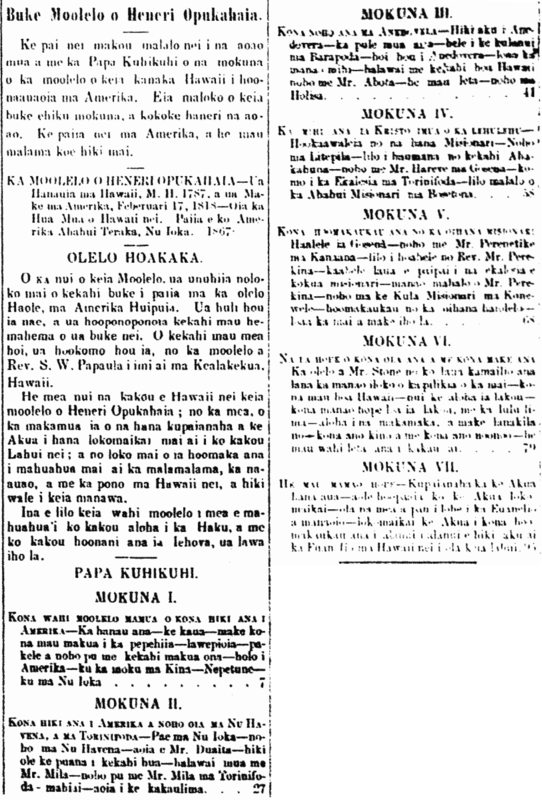 On the 10th of February, John Ricord, William Richards, Zorababela Kaauwai, J. Y. Kanehoa, and Ioane Ii were appointed Commissioners to settle land claims [Luna hoona i na kumu kuleana aina]; the Minister of Interior selected them and gave them an oath as per what is prescribed in Article 4 of Chapter 7 of Part One of the Second Act of Kamehameha III. Ke hoohiki nei kela mea keia mea o makou, e imi pono me ka paewaewa old i na kumu kuleana aina a na kanaka i hoopii mai nei no ke Aupuni o ko Hawaii pae aina, a e hooholo makou i ka olelo pono no ua kuleana la, ke kumu kuleana, ka loihi o ke kuleana, a me ka nui o ka aina, e like hoi me ka olelo iloko o ka Haawina eha o ka Mokuna ehiku o ka Apana m ua o ke Kanawai i kapaia, ‘He Kanawai hoonohonoho i na hana i haawiia i na Kuhina o ko Hawaii Pae Aina,’ i hooholoia ma Honolulu i keia la _____ o _____, 18_____. Imua o’u _____ _____, ke Kuhina Kalaiaina. We and each of us do solemnly swear that we will carefully and impartially investigate all claims to land submitted to us by private parties against the government of the Hawaiian Islands; and that we will equitably adjudge upon the title, tenure, duration and quantity thereof, according to the terms of article fourth of the seventh chapter of the first part of an act entitled “An act to organize the executive departments of the Hawaiian Islands,” passed at Honolulu, _____ day of _____, 18____. Subscribed and sworn to, this _____ day of _____, 18_____. 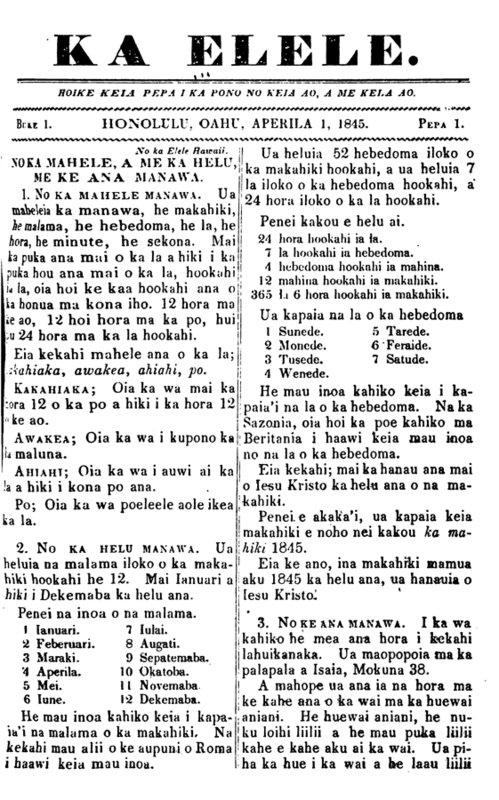 Ka Elele Hawaii, Buke I, Pepa 24, Aoao 184. Maraki 3, 1846. Clarifications by a Newspaper Writer about Her. Americans sometimes forget that within one of the Territories of the United States there lives a real ex-Queen who owes the loss of her crown to the activities of American missionaries. 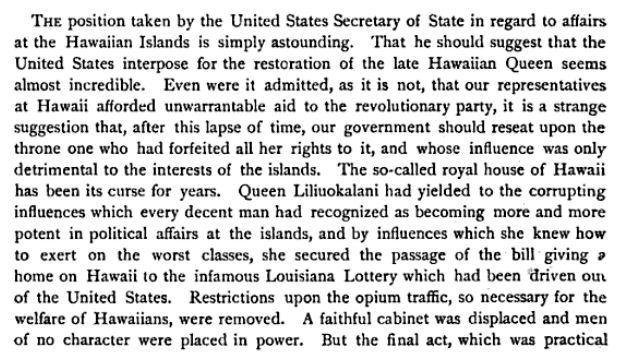 This Queen is, of course, Liliuokalani, of Hawaii, dethroned in the revolution of 1893. She is now a frail old lady of nearly seventy-nine years, and few but her immediate household and closest friends ever have the opportunity of meeting and talking with her. 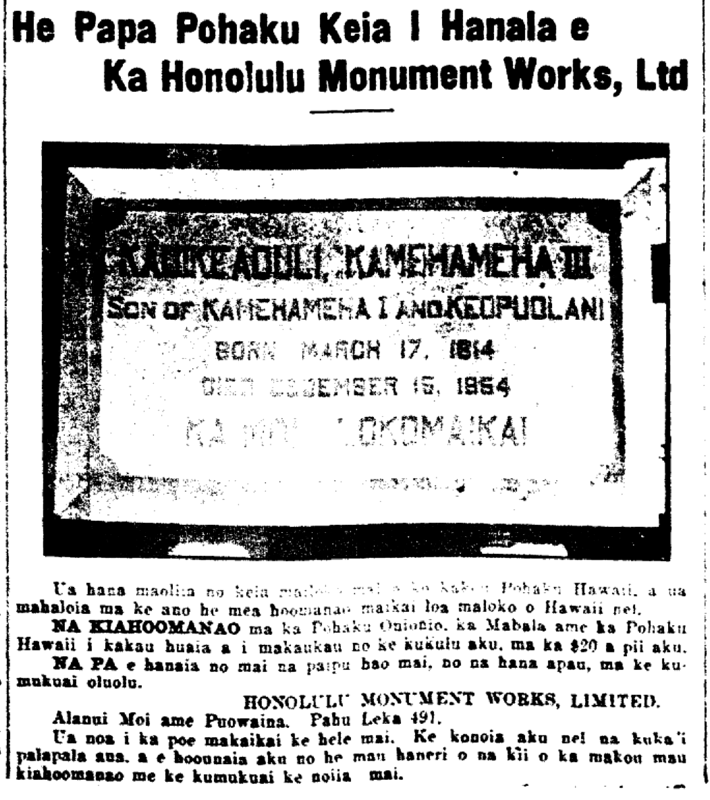 Advertisement by company that made Kauikeaouli memorial, 1914. This was actually made out of our Hawaiian Stone, and it is praised as a fine memorial here in Hawaii. MONUMENTS of Granite [Pohaku Onionio], Marble [Mabala], and Hawaiian Stones engraved and ready to stand, from $20 and higher. FENCES made of metal pipe, for all jobs, at reasonable prices. King and Punchbowl Streets, Mail Box 491. It is open for people to come tour. Mail correspondences are welcomed, and hundreds of pictures of our monuments and their prices will be sent if asked for. [It seems like this establishment was located right across from Kawaiahao Church, as seen in this picture on page 303 of the July 1912? edition of the Pacific Magazine. Ka Nupepa Kuokoa, Buke LII, Helu 14, Aoao 4. Aperila 3, 1914. THIS PAPER SHOWS WHAT IS RIGHT FOR THIS WORLD AND THE WORLD TO COME. Ka Elele, Buke 1, Pepa 1, Aoao 1. Aperila 1, 1845. Another “Memoirs of Obookiah” translation, 1867. Book of the Moolelo of Heneri Opukahaia. We are printing belwo the first pages of and the Table of Contents of the Chapters of the story of this Hawaiian that was educated in America. In this book is seven chapters, and it is almost a hundred pages. It is being printed in America and it will be here in a few more months. THE STORY OF HENERI OPUKAHAIA—Born in Hawaii, A. D. 1787, and Died in America, February 17, 1818—The First Fruit of Hawaii nei. Printed by the American Tract Society [Amerika Ahahui Teraka], New York, 1867. The majority of this Moolelo was translated from a book published in English in the United States of America. However, information was researched, and some of the errors of the book was corrected. Some things were added from the moolelo that Rev. S. W. Papalua investigated at Kealakeakua, Hawaii. This story of Heneri Opukahaia is something important to us Hawaiians; for this is the first of the miracles that God performed benevolently upon our People; and through this start, the enlightenment, the knowledge, and the righteousness of Hawaii has increased until this day. Ka Nupepa Kuokoa, Buke VI, Helu 20, Aoao 3. Mei 18, 1867.